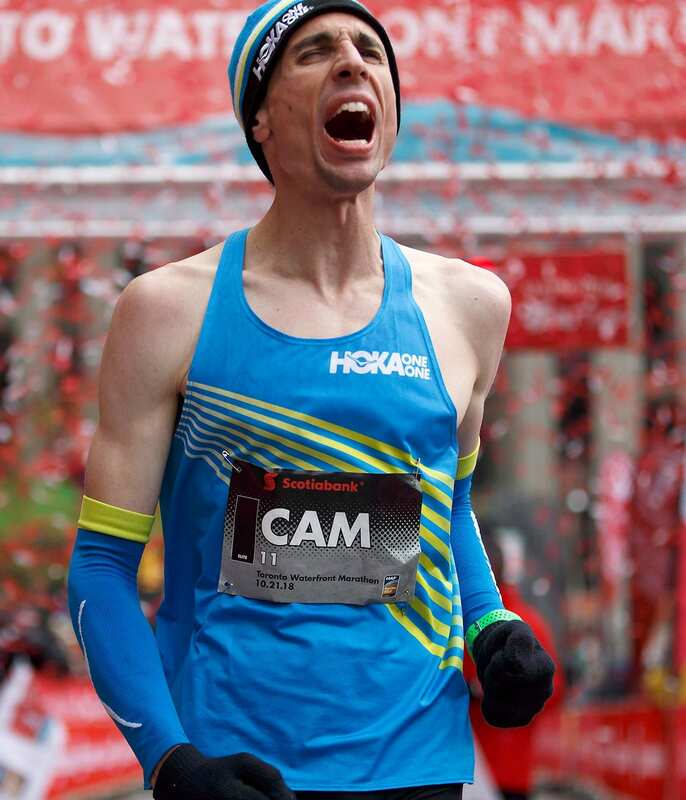 On Oct. 21 in Toronto, I debuted in the marathon and ran the fastest time ever by a Canadian. Crossing the line in two hours nine minutes 25 seconds, I was overwhelmed with emotion — elation, relief, and an appreciation never felt before in my career. Looking over to my parents and wife, I saw them in a similar state and understood that this moment was so much more than enjoying a great performance, but celebrating the rebirth of a career that seemed finished. Two years of crawling back from surgery felt distant, just a sad memory, for onlookers and supporters; most saw the result and were impressed without even knowing how I struggled. For a long time before surgery in July of 2016, every step onto my left foot was a reminder that something was wrong, and a previous misdiagnosis made it difficult to quantify what the issue was. I wondered, “Is this in my head? Am I just weak-willed?” Questions that an elite distance runner, who makes a career of being tough, should never ask. I continued to race anyway, chasing the dream of qualifying for the 2016 Olympics, and underperforming until I couldn’t run at near my previous level. I ran at our national championships, a race I had won the previous four years, and placed seventh overall, failing to make Team Canada. Dr. Randy Gregg was able get me an MRI that night, to confirm something was wrong; the results showed I had a stress fracture in my navicular bone and a split tear in the peroneal tendon of my left foot/ankle. As if missing the Olympics wasn’t hard enough, I left in a boot cast. My coaches and I wondered how this injury could exist, and how I was physically capable of running at all. Deciding to order a bone scan to confirm the diagnosis only revealed a second stress fracture in my talus, and a bone spur that frayed my peroneal tendon; someone quipped that there should be no more scans lest we make things worse. Days later I was contacted and told that if I didn’t have surgery, my navicular bone may lose blood supply and die. It was a situation where I either have surgery and have a chance at continuing my career or I’m likely finished competing; this wasn’t even a decision. A fantastic surgeon, Dr. Amol Saxena, gave me a second chance, but I didn’t understand how much of a reboot this was. Before surgery I eclipsed 300 km of running a week, but afterwards, I was capable of only 15 minutes. I was starting from scratch, and the thought of a marathon, let alone a fast one, was far from my mind. My left foot was inflated, inflexible, weak, riddled with pain and nerve damage, but if I could learn to use it again, I believed it would be better than ever. However, the reality was, I’d never faced a trial like this, and I underestimated what it would take to climb back to my best. Two years of training and competing with sub-par results became frustrating; I felt angry with my past and unwilling to accept it. Feeling hopeless, I wondered whether my commitment to working hard would be enough, and if the journey back was worth it. Contemplating what my life could be without running scared me; I didn’t know who I was besides an athlete. Finally, one day I broke down and cried uncontrollably as I mourned the death of my former career; that was the moment I began to find peace. Expecting the surgery to make things perfect was unreasonable, and I understood that the trauma changed me. I learned to appreciate each moment; not focus on who I was or what I’d do. My foot was not the same but functional again, so with a new vigor, I committed to running the Scotiabank Toronto Waterfront Marathon. The marathon felt like an exciting new challenge. My ankle held up well running the mileage and workouts I needed to prepare. For the first time in recent memory I felt truly fit, confident, and ready to take on a race. I ran as far as 39 km in practice multiple times, at a solid pace so I thought I could at least finish decently. However, even as a seasoned athlete, there are a lot of things you simply can’t prepare for without actually experiencing the race, so I was anxious to see how I fared. Others told me the last 10 km of the race would be the most difficult thing I ever did, the pain being equivalent of child birth; none of this eased my nerves. Despite the mounting pressure regarding the 43-year-old national record of 2:10:09, I felt happy and appreciative that I could even run a blissful side-effect to overcoming the past that haunted me. When Sunday finally came, racing was tough but also fun; that joy was something that I sorely missed until recently. As the gun went off I immediately settled into my goal pace of a 2:09:00 marathon, and I had two athlete pacers who I tucked in behind. We cruised along, and a group of leaders disappeared from view as I put my complete faith in those leading me. It was a cold day, barely above freezing, and it was hard to know if I had enough clothing on. If we faced the wind for any length of time I worried about shivering and burning precious energy. Briefly, it snowed on us; I only imagined what my two pacers from Kenya were thinking when they glanced at each other, and hoped it wouldn’t last. Despite my concerns, the cold never became an issue for me; surely an advantage of growing up in Canada. Approximately every five km we would grab an assigned bottle that had a pre-mixed carbohydrate drink of our choosing — mine was simply lemonade flavoured as “black cherry.” When I came upon my second beverage I nearly slowed to a stop looking for it only to realize it was missing, and I tried not panicking as I drank the Gatorade available on course until my next drink. I spent the next few kilometres thinking how annoyed I was that it wasn’t there, but it is a fairly regular occurrence so I was aware of the possibility. When things don’t go perfectly you have to be able to forget about the past, which is a familiar concept for me. Besides this bottle mishap, I was both relaxed and practically unconscious between bottle stations before returning to my senses while approaching a new one. The first split I paid attention to was the halfway point. I knew I was on pace and my confidence grew because I felt great; even the uncertainty of the final 10 km didn’t feel so intimidating anymore. Our group caught athletes who slowed from the leading pack, but I was oblivious to my overall place. Approaching 30 km, the pack of runners suddenly split apart through a disruptive bottle station; another runner, who I now know as Daniel Mesfun, and I broke away. Earlier in the race he cut me off and I stumbled, nearly tripping, wondering “What is this guy’s problem?” I assumed he was competing in the half marathon going concurrently. It felt like a reasonable thought since he didn’t have an elite athlete bib nor was fuelling at the initial bottle stations, but now seemed an absurd judgment as he pushed the pace ahead of me. “This is my moment,” I thought, “I’m taking back my career.” I was prepared to fight all the way to the finish. Daniel and I quickly got into a symbiotic situation as we shared the lead in our two-man pack clocking some of our fastest times in the late sections of the course. Certainly, at some point it would be just me, whether I couldn’t stick with him or vice versa, and eventually that moment came. I reached three kilometres left in the race alone, now paying close attention to my watch, and did some quick calculations in my head; anything could happen but I was moving well under record pace. A spectator told me I was catching another runner, Jake Robertson, and I used it as added motivation. I had been tired for kilometres and now beginning to lose vision in my left eye, but I came way too far to give in and been through too much. Jake came into view and I had a much-desired target to chase; he grew bigger and I inched closer. I caught him, moving me into fourth place as I approached the final stretch. There was a tantalizing countdown every 100 metres to the finish line. Looking at my watch, I knew what was about to happen. I cheered, and thought how ready I was to be finished, but not with my career anymore. Watch Cam Levins obliterate Canadian men's record in marathon debut. A: If it was easy, everyone would do it. A: Big fan of RuPaul’s Drag Race. A: Eliud Kipchoge, Arthur Lydiard, Terry Fox, Sebastian Coe, Malcolm Gladwell, John Lennon. A: Derek Redmond finishing the 400 metres in the 1992 Olympics helped by his dad. A: Personal best in the half marathon.